Kathmandu: India on Saturday donated 30 ambulances and six buses to Nepal and extended its support to the country in achieving prosperity. India's gesture came as it marked 70th Republic Day. India's ambassador to Nepal Manjeev Singh Puri handed over keys of the ambulances and buses to the recipient organisations amidst celebrations in Indian embassy premises, Kathmandu on Saturday. Since 1994, the Government of India has gifted 722 ambulances and 142 buses to various organisations across Nepal to expand access to healthcare and educational services in Nepal. 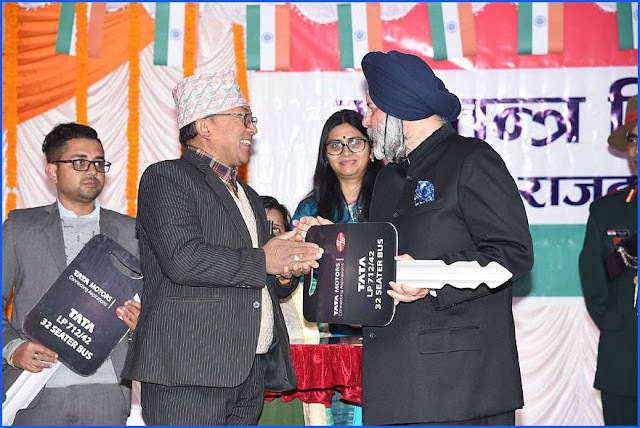 Ambassador Puri also distributed cash to the kins of war veterans from the Gorkha regiment and gifted books to 53 schools and libraries across the country. Puri unfurled the Indian national flag and read out the message delivered by the president of Indian to the nation on the occasion of the Republic Day. "Government of India will extend support to government of Nepal in attaining its goal of 'Samriddha Nepal ra Sukhi Nepali' or 'Prosperous Nepal and Happy Nepali'," assured ambassador Puri. The function was attended by more than 2,000 people, including Indian embassy staff, Indian citizens residing in Nepal, Indian business community in Kathmandu, media persons and students.